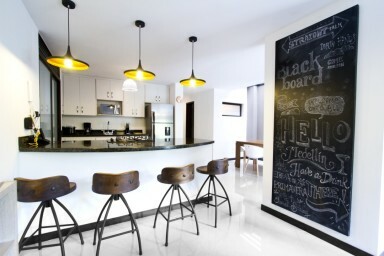 Completely renovated apartment, decorated by an interior designer. Balcony overlooking the best street in the area. The apartment is completely renovated from top to bottom and provides the perfect accommodation for two people sharing an unforgettable experience. Both bedrooms have queen sized beds and cable television on flat screen TVs. The apartment has been designed by a professional interior designer who has created an oasis in this lively area. The living room is decorated with comfortable and stylish furniture that leads onto a balcony overlooking the best street in the area. If you’re happy to be just one in the crowd, we’ve got tons of apartments in Poblado. If you want to live a little, have a unique experience and take home an unforgettable memory, this apartment is for you. Jardines is a little known gem of a enclave in Envigado, just a short cab ride from its more famous neighbor, Poblado where the majority of tourists stay. It’s one of those places that you’ll visit once, and never want to leave and you’ll be grinning to yourself that you know something cool that no one else has experienced. We have handpicked a number of excellent, economically priced apartments right in the center of the hippest part of the city. You’ll be literally on the doorstep of the city’s best restaurants, bars, cafes, bakeries and shopping. It’s all here, but only the cool crowd know about it.